What is the least amount of information you need to know in order to be able to identify a line exactly? Two pieces of information: a point that the line passes through, as well as either a second point on the line or the line’s slope. How can so little information be necessary? Start with the first point whose coordinates you are given or can figure out. Imagine the infinite number of lines that could pass through the point. You can simulate this by thinking of the line as a spinner, anchored by the point… flick the line/spinner with your finger, and it spins madly about the point. Which of all these possible lines that are being spun through is “the one” you are being asked to describe? You need a way to stop the spinner from spinning at a precise spot. One way to stop the spinner is to be given a second point that the line passes through. Any second point that does not lie on top of the first point will “prevent” the line from spinning or moving at all. A second way of stopping the spinner is to be given a slope for the line. In this notation, x1 is the x-coordinate of the first point, and y1 is the y-coordinate of the first point. Why is this called the “slope”? 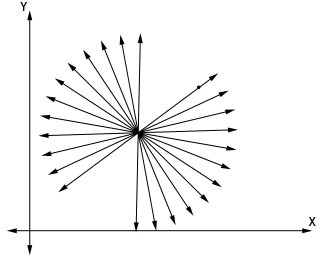 Draw two points on a piece of paper at about a 45 degree angle to the horizontal, then connect them with a line segment (see the diagram below). Visualize this line segment as the hypotenuse of a right triangle, and draw a line parallel to the x- axis from the lower point to under the second point: this is the base of the right triangle. Draw a second line, this one parallel to the y-axis, from the upper point down to where it meets the end of the base you drew, forming a right angle. Note that the difference of the two original points’ y-coordinates, y2-y1, represents the length of the leg you drew parallel to the y-axis, otherwise known as the “rise”. Similarly, x2-x1 represents the length of the base of the triangle, or the “run”. The ratio of these two differences, Rise over Run, tells you the slope of the line: how much it “rises” for every one unit it “runs”. But what does the “slope” tell you about the line? It can be interpreted in several ways: as a measure of the steepness of the line (a visual interpretation), or as a rate of change (a quantitative interpretation). It is often easiest to think of slope visually (the greater the slope, the faster the line rises as you move to the right), but it will be most useful to you as a rate of change. The slope tells you how much will the line Rise for every unit you Run (move to the right). Any quantity that is expressed as a ratio can be though of as a slope (Miles per Gallon, Miles per Hour, Dollars per Item, Teaspoons per Cup, Grams per Milliliter, Commercials per Show, Minutes per Song, etc.). If the slope described by a problem never changes, the graph will be a line. An example of this could be a car that travels at precisely 52 miles per hour for the entire duration of a trip (it never speeds up or slows down). If the slope changes at all, the graph will no longer be a line. An example of this could be a car that starts a trip travelling 32 miles per hour, and ends the trip travelling at 47 miles per hour. The graph of this car’s distance vs time will be steeper at the end (it will be increasing faster there) than it was at the beginning, and therefore cannot be a straight line. Suppose that, instead of starting with two points, you start with the slope – either because it was given to you, or you calculated it from the coordinates of two points known to be on the line. You can envision drawing an infinite number of lines on a beach, all parallel to one another (having the same slope – see the diagram below). But which of those lines is “the one” you are supposed to work with? Only one of the lines you drew will pass through the coordinates of the point(s) you were supplied. There are two special cases you should know about: the slopes of horizontal and vertical lines. A horizontal line never “Rises”. All points on a horizontal line have the same y-coordinate. For any “Run” you choose, the “Rise” will always be zero. If this were not the case, the line would not be horizontal. Therefore (Rise / Run) will always be (zero / Run), which will always equal zero. A horizontal line has a slope of zero. Always. A vertical line never “Runs”. All points on a vertical line have the exact same x-coordinate. If you “Run” at all, you have moved to a new x-coordinate that the line does not pass over (or under), and therefore you will be “off the line”. Therefore, you cannot “Run” at all when a line is vertical, and the “Run” must always be zero. So, (Rise / Run) will always be (Rise / zero), and the result of dividing by zero is “undefined”. A vertical line has an “undefined” slope. Always. A line may, or may not, intercept the y-axis. If it does, the coordinates of that point will be (0,y) which correspond to evaluating the function when the independent variable (often x or t) is zero. Why is this point significant? Because it tells you what “the result” is at “the start” or “the beginning”. If a word problem states something like “Jenny started 5 miles from home”… the word “started” should alert you that 5 is probably going to be the y-intercept, and that (0,5) is a point on the line. If a line never intercepts the y-axis, then it must be a vertical line (parallel to the y-axis) and its slope must be undefined. Only one x value can be used as an input to this function, and any y value is a valid output for that x value. A line may, or may not, intercept the x-axis. If it does, the coordinates of that point will be (x,0) which correspond to the value of the independent variable (often x or t) at which the line crosses the x-axis. If you look at this point on the graph of a line, you will notice that this is where the function’s results (the line’s y values) change sign (from negative to positive, or vice versa). On one side of this coordinate, the line is above the y-axis. On the other side, it will be below. If a word problem states something like “If Jake sold fewer than 6 widgets, he lost money”, this tells you that 6 is the x-intercept, and therefore (6,0) is one point on the line. If a line never intercepts the x-axis, then it must be horizontal and parallel to the x-axis. This tells you that its slope must be zero, that the rate of change for the situation is zero: the output of the function never changes. Note that there are an infinite number of ways you can create “equivalent equations” for any given equation, so the three forms above are only three of many that are possible. However, these three are very useful for the following reasons. Slope-intercept form is what you will end up with if you solve a linear equation for the dependent variable (usually y) and simplify, with the independent variable (usually x) term first and the constant term second on the right-hand side. This form of the equation makes graphing a line very easy, as the slope of the line will be the coefficient of the independent variable (usually x), and the y-intercept will be the constant term. Try something and see what happens. Only one term can change on the right-hand side of an equation in slope-intercept form: the one involving the variable. As different values are substituted into the variable, they are multiplied (or scaled) by “m”. Therefore, each increase of one unit in the variable (a “run” of one) causes the result to change by “m” (the rise). So, rise over run, the slope, will always be (m) / (1) = m, which is the coefficient of the independent variable. Think about it. If the right-hand side of the equation contained only the constant term “b”, the value of the right side would always equal “b”, so the graph would be a horizontal line with a y-coordinate equal to “b”. This is a good conceptual “starting point” for the graph of this equation. But the right-hand side of the equation has an “mx” added to the “b”. Since “m” does not change, every change in “x” is scaled (magnified) by the same “m”, because that is what multiplication does. So the graph must “rise” from its starting point by “m” for every one unit change in “x”. Play around with Slope-Intercept form using an interactive GeoGebra graph to get a feel for how the constants m and b affect the line. Standard form is what you will end up with if you start from slope-intercept form, then move all variable terms to the left of the equal sign in alphabetical order. This will leave only the one constant term on the right of the equal sign. This form of the equation is convenient for solving systems of equations using matrices or a linear combination of equations (also sometimes called the multiplication-addition method). Play around with Standard form using an interactive GeoGebra graph to get a feel for how the constants a, b, and c affect the line. as this lets me treat both “x” and “y” identically. What value of “y” makes the expression in parentheses on the left equal zero? That is the amount and direction of vertical translation that the origin on the parent function y = mx underwent (the y-coordinate of the point you know on the line). What value of “x” makes the expression in parentheses on the right equal zero? That is the amount and direction of horizontal translation that the origin on the parent function y = mx underwent (the x-coordinate of the point you know on the line). Play around with Point-Slope form using an interactive GeoGebra graph to get a feel for how the constants h, k, and m affect the line. Once you are comfortable producing “the other three” items in the above list from any one of these starting points, you are ready to take the test! Given a graph as a starting point, you can build a table of values showing the coordinates of all points you can identify exactly on the graph. Be careful to pick only points whose coordinates you are certain of. Try not to pick points for which you have to guess at a value for one of the coordinates (is it 3.4 or 3.5?). Once you have a table of values, calculate the slope of the line. If you are asked to write an equation that describes this line, two equation forms are usually the most convenient to use as a starting point in describing this line: Slope-Intercept, or Point-Slope. You will need to choose one based on whether you know the y-intercept (making Slope-Intercept easy) or not (Point-Slope may be easier for you, or not. It is your choice). Once you have written down one of these equation forms, if you are asked to put the answer in Standard Form use algebra to move all variables into alphabetical order on the left side of the equal sign, and move any constant term to the right of the equal sign (if it is not already there). 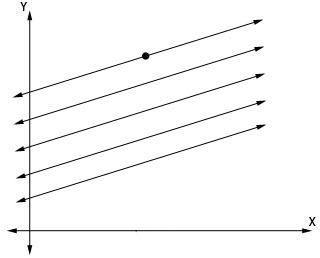 Given a Table of Values as a starting point, you may choose to use it to graph the line first, or to calculate the equation of the line first. Once you have completed one, do the other. Given the equation of a line, many people prefer to use algebra to put the equation into Slope-Intercept Form (if it is not already in that form) before they graph it. However, if you recognize that the equation is already in Point-Slope form, you are welcome to leave it as is to graph it (if you are comfortable doing that). You can build a table of values (if asked to) by picking whatever x coordinates you wish (I usually use something like -1, 0, 1, 2), substituting each of them in turn into the equation (in place of x) and calculate the corresponding y coordinate for the point. Word problems can be frustrating at first to many students – so I have consolidated my suggestions about how to approach them in another posting that may be helpful at this point. After doodling the information in the problem, you should find that you have been given all the information needed for at least one of the three starting points mentioned above. In reading through the word problem, look for values that could be a coordinate, and/or values that could be a rate of change (slope). This information may not be presented in mathematical notation or using the usual mathematical terminology, and it may even be scattered throughout the verbal description instead of packaged neatly for you – for example, the x and y values that correspond with one another may not appear in the same sentence. As you read the words, build a picture of the situation for yourself – preferably on paper by doodling it. Every fact presented should make it into your doodle somehow. From there, you should be able to identify either two points, or a rate of change and one point… which is enough information to begin solving the problem. If a problem starts from one of the “Starting from” points mentioned above, you could also be asked to create a word problem whose solution is the graph, table of values, or equation as provided by the teacher. 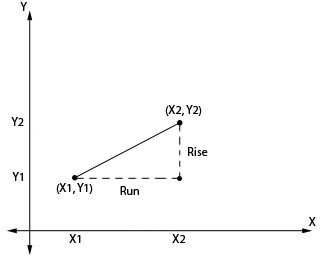 You may use the rate or slope to determine rise and run values which you convey verbally in the problem in some way, along with enough information for the reader to determine at least one point on the graph- either a starting point (y-intercept) or some other pair of coordinates that will lie on the graph of the situation being described.